I’ve made several references to Aleksandr Isayevich Solzhenitsyn in talking about my Red Slaves series, so it seemed only fair to dedicate a post to this man. He was a dissident born in December 1918 and was the first to expose the western world to the Soviet system of gulags, or forced labor camps, through his writing–which was based largely on his personal experience of that system. His prosecution under Article 58 for anti-Soviet propaganda operated as an object lesson for Igor in Dust to Blood, and remains a symbol of how repressive the Soviet regime was for free-thinking individuals. Literature transmits incontrovertible condensed experience… from generation to generation. In this way literature becomes the living memory of a nation. Solzhenitsyn was awarded the Nobel Prize in Literature in 1970, and the autobiographical essay he penned on that occasion is worth reading for yet another perspective on what repression and secrecy can inflict on an individual. 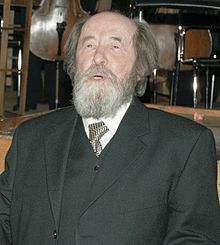 He died in 2008 in Moscow at the age of 89.